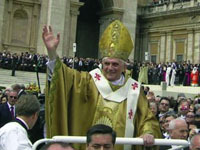 our new Holy Father, Pope Benedict XVI. Our hearts overflow with gratitude to God, Who so graciously strengthens our faith, renews our hope and enkindles our love. Led by the Successor of Peter, we set out anew and ‘cast our nets’ into the vast ocean of God’s People. humanity, always confident that Our Lady is at our side, most especially when we ‘contemplate the face of Christ’ in the mysteries of the Holy Rosary. We assure you of our prayers in this special Year of the Eucharist, keeping you and all your loved ones near the altar of the Lord day by day. To express our sincere and heartfelt gratitude for your generous support of our Rosary Community, we have arranged a Triduum of Masses and prayers for the Solemnity of the Sacred Heart of Jesus and the Feast of the Immaculate Heart of Mary for all of your intentions. Pope John Paul II was indeed the Pope of Fatima. In this city we could never forget his three visits on the 13 May in the years: 1982, 1991 and 2000. And on 25 March 1984, Fatima went to Rome. The image of Our Lady of Fatima was taken from the Chapel of Apparitions and placed in St. Peter’s Square, where the Holy Father offered the solemn Act of Consecration to the Immaculate Heart of Mary in union with all the Bishops of the world. Three years had passed since the attack on his life in that same place. His Pontificate, inspired by continual contemplative prayer, consumed by joyful itinerant preaching, accompanied by untold sufferings, borne with peace and joy in union with Jesus through Mary and closed with his final “Amen” uttered just before his last breath, will continue to bear fruit – fruit that will last unto eternity! Compelled by the love of Christ (2 Cor 5:14) Pope John Paul II pursued the ‘ministry of reconciliation’ (2 Cor 5:18-20) entrusted to him as Priest, Bishop and Chief Shepherd always proposing, not imposing, the message of the Gospel – repent and believe in Jesus Christ, Saviour of the world. First and foremost, Pope John Paul II was a Priest of Jesus Christ and thereby a spiritual father to all. we trust in Your Divine Mercy… Stay with us Lord! ”With all our heart we thank you Pope John Paul II! Alleluia! ‘How good God is! 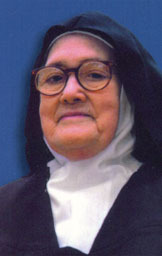 He is the God of peace, and it is along paths of peace that He leads those who trust in Him.” Sister Maria Lucia. We conclude this very brief remembrance of Sister Maria Lucia with some of her thoughts expressed in the book Calls From the Message of Fatima. “In prayerful silence in the solitude of our churches, He continues to offer himself unceasingly to the Father as a victim on our behalf; forgotten, despised, ill-treated, humble and poor, He remains a prisoner in our tabernacles. And the Message of Fatima continues to call on us to offer to the Most Holy Trinity the Victim on our altars in reparation for all the sins by which He is offended. “We are temples of God, and God is our dwelling place; we walk in the light of the glory of God, we were chosen by God and God called us and knows us by name…Our greatness is immense: we were chosen by God, we are kept by God, we are sanctified by the presence of God for the praise of His glory, we are living tabernacles where the Most Holy Trinity dwells, we are the House of God and the Gate of Heaven! are grace, you are love! and unite myself entirely to You. “Behold your Mother.” And so he did as the beloved disciple did: he took her into his own home” (Jn. 19:27) – Totus tuus. 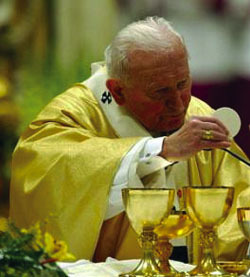 And from the Mother he learned to conform himself to Christ…” (Funeral Homily 8 April 2005). On 13 June 1917 in Fatima, Our Lady said to Lucia: “…you are to stay here some time longer. Jesus wishes to make use of you to make me known and loved. He wants to establish in the world devotion to my Immaculate Heart.” To this mission she dedicated the next 87 years of her life. Everything she did or said, and especially her prayer, was under the patronage and guidance of the Immaculate Heart of Mary, our Mother. For example, before writing she would invoke Mary to ‘guide her pen’ so that not a word or even a syllable would be written that was not in accord with God’s will. Hidden in the cloister for the last 57 years of her life, Sister Lucia’s mission remained the same: to make known and loved the Immaculate Heart of Mary. 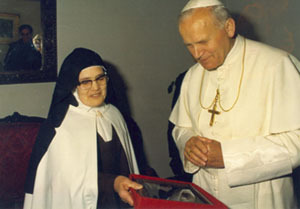 We can perhaps say that the most beautiful fruit of her mission was accomplished in the soul of Karol Wojtyla, who was destined to become the Pope of Mary, Most Holy. Yes, intimate but as yet unknown ties joined the lives of Sister Lucia and Pope John Paul II long ago. 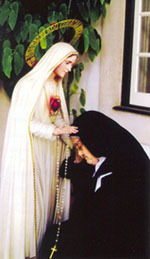 As the years passed the young seminarian from Eastern Europe, who had discovered St. Louis Marie de Montfort’s True Devotion to Mary, would meet the one, who as a 10 year old child in Fatima, on the western seashore of Europe became Heaven’s instrument to lead the world to the refuge of the Immaculate Heart of Mary. These two chosen souls so intimately united to Christ through Mary, His Mother were called home to Heaven at the same hour of history and on days directly associated with the Message of Fatima: the 13th and the First Saturday of the month. God’s timing is both mysterious and marvelous! For our part, we have only to imitate these chosen instruments of the Lord entrusting every aspect of our lives to Mary, our Mother and asking St. Joseph to help us also to ‘grow up in Christ! On 19 April 2005 on the second day of the Conclave to elect the successor of Pope John Paul II, Joseph Cardinal Ratzinger was chosen as the Vicar of Christ and took for his name Benedict XVI. As Cardinal he visited Fatima in October 1996 and also wrote the commentary on the Third Secret of Fatima after its release in May 2000. While in Fatima in 1996, the then Cardinal Ratzinger was interviewed about the relevance of the Fatima Message in light of the changes that had occurred in Eastern Europe. Joined with the sons and daughters of Saint Dominic, I invoke the intercession of Mary, our Lady of the Rosary, that she accompany you in moments of joy, of light and of pain while you guide and walk with the Church toward the eternal glory of her Son. The twentieth World Youth Day will take place in Cologne, Germany from 16-21 August 2005. The theme this year is “We have come to worship Him” (Mt 2:2), words of the Wise men from the East, who following the star came to Bethlehem in search of the Messiah. The Cathedral of Cologne, where the relics of the three Wise men have been traditionally venerated for many years, will be at the centre of World Youth Day. Since 1986 when the first World Youth Day was officially celebrated until now, hundreds of thousands of young people have gathered together to share and strengthen their faith through catechesis, the Sacraments and the preaching of the Holy Father present among them. This year Pope Benedict XVI plans to join them as the successor of Pope John Paul II, who initiated these special meetings twenty years ago. Please unite with us in prayer for all the young people of the world. May we help to gather them together for Jesus with the ‘spiritual net’ of our Rosaries. May they answer the ‘call’ of Christ: “Come follow Me!” Oh Mary! Pray for our young people! proclaimed Pope John Paul II on 29 October 1978, within two weeks of his election as Vicar of Christ. The prayer of the Rosary accompanied him all his life. As he lay dying, pilgrims in St. Peter’s Square prayed the Rosary for him, and as they concluded it was the Holy Father himself who, with enormous effort, said “Amen!” Moments later he entered into the eternal embrace of the Most Holy Trinity and the Virgin Mother of God. The Year of the Rosary and this Year of the Eucharist were Pope John Paul’s gift to the Church in his final years. He taught us clearly that we go to Jesus through Mary – to the holy Eucharist through the Holy Rosary of Mary – because in the Holy Rosary we contemplate the face of Christ; in Holy Communion we actually receive Christ, Body, Blood, Soul and Divinity. The Holy Eucharist is the Sacrament of Divine Love; the Holy Rosary is the sacramental of the love of the Hearts of Jesus and Mary. In these times of darkness and confusion Pope John Paul II points us directly to the source of all light and strength to continue going forward. In this special Year of the Eucharist we encourage you to profit by the treasury of indulgences, that Holy Mother Church has opened to all the faithful. Assist at Holy Mass as often as possible. And prepare for Holy Communion with the Sacrament of Reconciliation. Make a spiritual Communion at various times throughout the day. Visit Jesus in the Blessed Sacrament. Keep Him company; the presence of a loving heart is so consoling to His Sacred Heart. Continue faithfully your Rosary Hour of Guard. May Our Lady of the Rosary of Fatima obtain for you and all your loved ones, all necessary spiritual and material assistance, in particular for those who are sick or suffering in any way. “A Plenary Indulgence is granted to all faithful and to each individual faithful under the usual conditions (sacramental confession, Eucharistic communion and prayer in keeping with the intentions of the Supreme Pontiff, with the soul completely removed from attachment to any form of sin), each and every time they participate attentively and piously in a sacred function or a devotional exercise undertaken in honor of the Blessed Sacrament, solemnly exposed and conserved in the tabernacle. 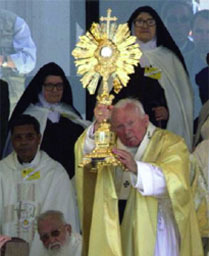 “The faithful who, through illness or other just cause, are unable to visit the Blessed Sacrament of the Eucharist in a church or oratory, may obtain a Plenary Indulgence in their own homes, or wherever they may be because of their ailment, if, … with the intention of observing the three usual conditions as soon as possible, they make the visit spiritually and with the heart’s desire, … and recite the Our Father and the Creed, adding a pious invocation to Jesus in the Sacrament.